Volkswagen (Lemon) from the Ads Portfolio. The Ads Portfolio of prints by Andy Warhol is one of his most sought after and iconic sets of prints. Connecting with consumers while representing a perfect balance of image, text, and simplicity, this ad achieved the seemingly impossible task of revamping Volkswagen after Hitler had formerly adopted it as his favorite car. Warhol’s piece pays homage to the genius of this Lemon. Volkswagen ad, conveying the beetle in a bright grass green against a royal blue background. The text on the bottom clearly stands out, with its famous closing line, “We pluck the lemons; you get the plums.” Like the Volkswagen company advertising its automobiles, Warhol’s Ads series serves as a form of advertisement for Warhol’s artwork, blatantly acknowledging the commercial nature of American society and urging consumers to continue buying iconic imagery that will forever proposition them with a new and exciting product. Connecting with consumers while representing a perfect balance of image, text, and simplicity, this ad achieved the seemingly impossible task of revamping Volkswagen after Hitler had formerly adopted it as his favorite car. Warhol’s piece pays homage to the genius of this Lemon. Volkswagen ad, conveying the beetle in a bright grass green against a royal blue background. 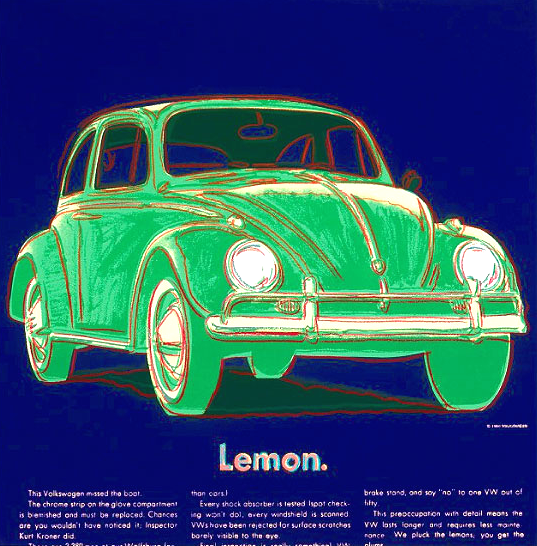 The text on the bottom clearly stands out, with its famous closing line, “We pluck the lemons; you get the plums.” Like the Volkswagen company advertising its automobiles, Warhol’s Ad series serves as a form of advertisement for Warhol’s artwork, blatantly acknowledging the commercial nature of American society and urging consumers to continue buying iconic imagery that will forever proposition them with a new and exciting product.